An Update on My Reading Goal: How Should a Person Be? 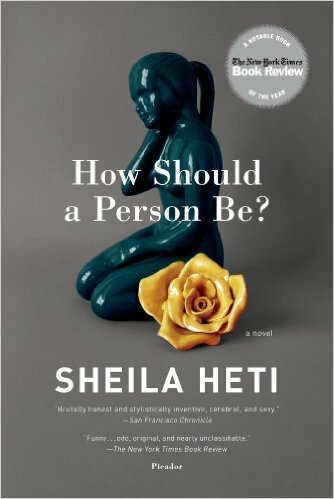 The most recent book I finished from this list published by the Huffington Post is How Should a Person Be? by Sheila Heti. This is Heti’s semi-autobiographical novel. It centers around a woman writing a play and wallowing in self-doubt. At first I was interested in Heti’s examination of female friendships, especially how it seems to be so difficult for women to make good friends after high school and college. A quarter of the way in, I began to lose interest. The author weaves back and forth between the play she is writing and the real world. Fair warning: This book features a lot of graphic sexual content. I am not offended by graphic sexual content in a book, but I am offended by a crazy plot with no real sense of direction. This has been my least favorite book on the list so far. Tagged Books, How Should a Person Be? Note to self: Don’t read. LOL. Thanks for the update.